The actress attended the day 1 of SIIMA 2017 and was looking gorgeous in an outfit by Nishka Lulla. 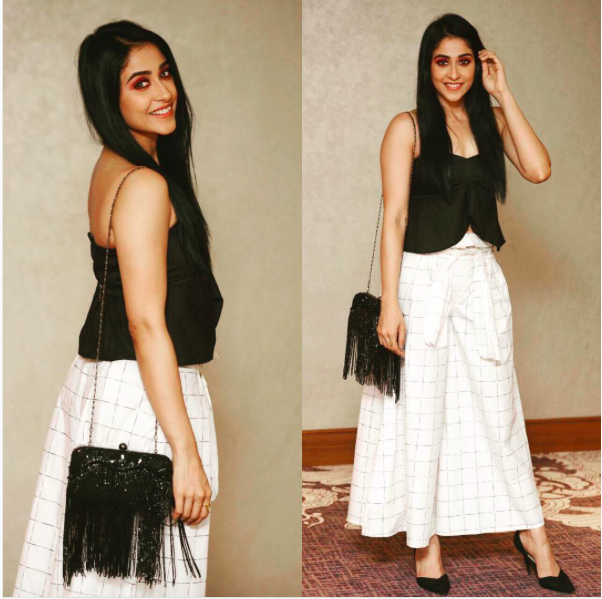 Regina Cassandra was clicked sporting a monochromatic in separates from Nishka Lulla‘s label on day 1 of SIIMA 2017. Her outfit consisted of a pant skirt with a black crop top. She added a statement tasselled bag that gave a 60’s vibe to the look. Shoes from Zara India rounded her look. Regina let her eyes do the talking with her eye-shadow palette in purple and pink taking away all the limelight. The silhouette of the pant-skirt seemed a little off but never the less she made it work. If only the hair wasn’t so poker straight. Love the statement eyes though! What do you guys think of this look? Comment below and let us know.